Love is a myriad things—a means of motivation, a means of sadomasochistic happiness, a catalyst to trigger the singular and direct destruction of barriers restricting a person’s inner soul and hidden potential. Above all, love is a reminder that all is not lost, and is rather the answer to a glaringly large amount of life woes. Love trumps the most inescapable, seemingly ingrained-in-fate occurrences. A quintessential example is none other than Erased or Boku Dake ga Inai Machi, a show that spends half of its episodes building an ostensibly inevitable romance—so obvious that fans were rallying to obscene extents of Facebook and Twitter vandalism to ensure what they thought was inevitable (but it most certainly was not). Rather than accept such a brutally obvious development that a majority of fans pined for, the creators were knowledgeable enough of the mysterious entity called love to know that fans are always misguided. If a fan should desire such a thing, than it is most certainly superficial, vain, and borderline idiotic. So instead, the creators went to promote a less conservative and restrictive relationship, one that embraces all and bars its doors to none. The creators’ goals manifested in two relationships: the unrequited romance of Satoru Fujinuma and Gaku Yashiro, and the underage forbidden romance between Satoru Fujinuma (29) and Katagiri Airi (17). The dichotomy of the actions taken by Hinazuki Kayo and those taken collectively by Yashiro and Airi is brutally clear. One had a child with another, the other two sacrificed their lives, well beings, mental stability and pursuit of happiness for Satoru’s sake. Thus an obvious love would have been a married Satoru and Kayo, but a true love, symbolic, timeless, death evasive, and impactful, is the one that never came to fruition: the very one that left hanging in speculation, waiting for the hopeful and not quite jaded fanfiction writers to latch onto and spin into beautiful tales embodying genuine moral qualities that should accompany the strength of love. 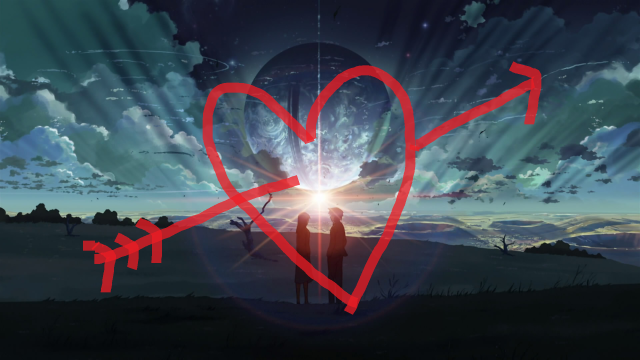 But of course, the discussion of love is hardly complete without a profound look into the film, 5 Centimeters Per Second. The film is the pinnacle of the everlasting idea of love, withstanding the grating, lethargic, and far-from-ideal social pains of reality. Many critical analyses praise the film for depicting everything that could have happened, a world of hypotheticals and potential crushed by the weight of million dollar background art. But in reality, the film is a manifestation of what love always will be, what it persists to be, what it endures in essence as—an entity of hope and revelation. For love will always be a reminder of what life aspirations could have been, but never will be. It is a romantic idea, nearly as much so as the idea of Satoru and Yashiro getting together. Just imagine if the male protagonist of 5 Centimeters Per Second, Takaki Tono, had never triggered a clearly early and premature onset of puberty that so thoroughly convinced him of love in elementary school. He would likely be a product manager rather than a computer programmer, more sociable, physically active, obliviously happy, and yet—the travesty—unaware of love. Each of the three acts serves to remind the audience that love remains impeccably close to the heart regardless of fulfillment and that cynicism has absolutely no merit. The film’s value through concluding nothing was a clear effort to utilize all 63 minutes, toss in surreal illusions of the world that only slightly dampens our view on reality, and force all people, 2D and 3D alike, to question the merit of life-long speculation and/or inconclusiveness and the fruitlessness of any realization of romance. Such a romantic question survives beyond the ephemeral lives of humans and into the great, expansive, everlasting void where all the things return to—indeed, the origin of slice-of-life. Such a question is a symbol—no, an incarnation of hope, a metaphorical light sparkling in the sky below an orb-moon-like object and cloud conveniently positioned without obstructing the view. Well this high-octane pseudo-philosophical bullsh*t.
Your miserable existance isn’t capable of grasping the greatness in this.